First time I heard about The Philippines is the social media capital of the world, not sure If I feel proud because I am proud of it or it is only a title. Anyone who is connected to any of my social media accounts may notice always in my About section "I am a social media addict." I could probably not think of any period in my life of enjoying it better than in this social media era. 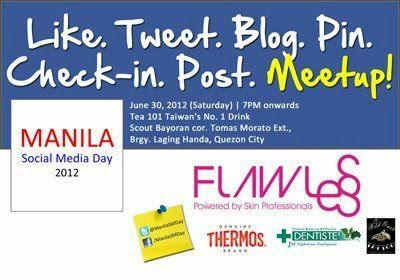 Jose Javier Reyes or Direk Joey, a local movie director is the guest speaker of Manila Social Media Day 2012 held at Tea 101 Quezon City. He started his talk by saying he has 16,500+ Twitter followers and 5,400+ Facebook friends. That in this social media infused life the word "friend" has become so cheap. it is very easy to call someone a friend. In fact it has become a verb and even an international dictionary has added the word "unfriend" officially to its list. Like me he also can't start and end his day without checking his Facebook and Twitter. He's got a blog as well and he does it seriously. Then he started becoming conscious about what will he post always thinking of which will have the best appeal and will have the most like or retweet from his friends and followers. That it came to a point he felt that who is he in person and who is he online are now two different personas. Direk Joey said that when a person is online a specific personality is created. That we may not be aware but we are selling ourselves in the Internet. That you are your product. That there is a part of us that we want to be like celebrities. That it is now ok to announce to what you had for breakfast, where you've been and you just got dumped than ever before. That more often than not we have given up our rights to privacy. Most of us have forgotten the word RESPONSIBILITY. How many of us got lots of "friends" to Facebook? How many of us were bashed on Twitter? How many of us used any of the social media sites for dating? How many of us STOOD UP for something? For sure many. But who does it wearing and IDENTITY not under an ANONYMOUS PROFILE? A salute to those who got the balls to SPEAK UP and to those anonymous beings, they're plain cowards. Direk Joey ended his talk by saying "anumang relasyong birtual ay walang halaga kung hindi magkakilanlan ng harapan or "any online engagements (friendship / romances) are nothing unless the persons involved should meet face to face". And no need to explain further we no know the reason.